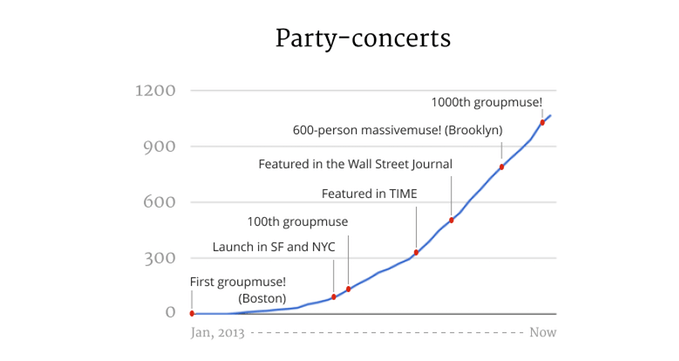 Groupmuse, the beloved Boston-startup that connects music lovers directly with musicians, classical musicians with a place to play and people to play for recently launched a Kickstarter campaign and they need your help! Groupmuse is looking to bank $100,000 dollars to help fund next year’s service in its current markets of Boston, NYC and San Francisco as well as to expand to Seattle. As of the writing of this article they have already raised $87,117 with 21 days to spare. If they raise additional money it will go towards starting new chapters in DC and Chicago. As lovers of all things music and Boston related, we urge you to give something to Groupmuse if you can or at least spread the word on social if you can’t. Best of luck to the Groupmuse team from the Sound of Boston team.